Distressed brass cabinet fronts look strikingly modern in this Italian kitchen. All that glitters is not gold. Some of it is copper, bronze, silver or pewter. But all of this glitter was on rich display at the Salone del Mobile, one of the world’s largest home design expos, in Milan, Italy, in April (and also at design industry events closer to home this year). Cabinets, appliances, fixtures, lighting, accessories and tiles are all showing up with brilliant metallic elements, and faucets are getting metallic finish makeovers from the must-have brushed and polished nickels of past years. The most popular trends in Europe often make their way here a few months or years later. Here’s to getting a head start! 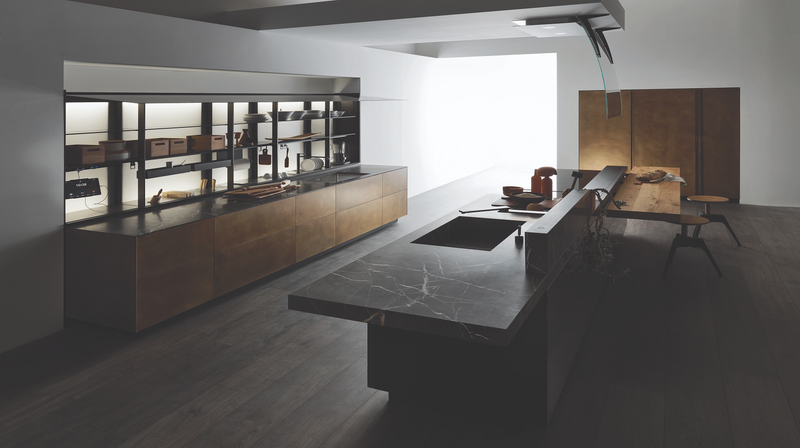 Kitchens were especially sparkly in Milan, with cabinet panels and trim, drawer fronts and appliance panels showing up in lustrous metallics. You could have a black kitchen with gold-paneled appliances or sophisticated neutral cabinets with gold trim. 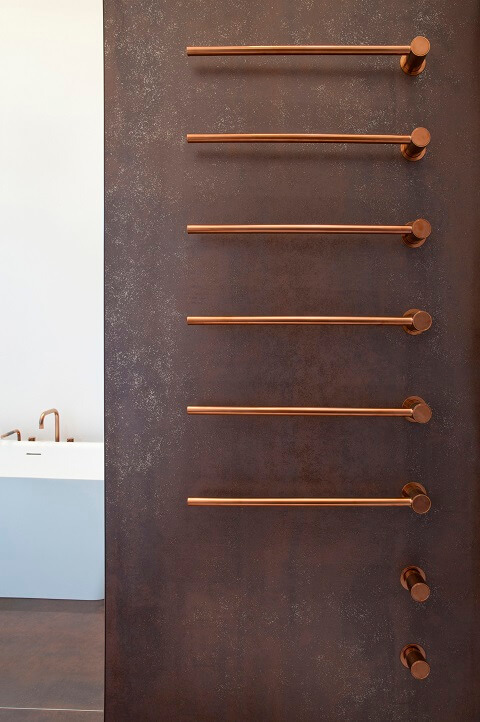 You could add just a touch of copper or bronze to your cabinet front detail and have them read industrial rather than fancy, or go full gold across a bank of drawers for a luxe look. Another widely seen trend was polished stainless steel countertops with integrated sinks. However, if implementing this in your own home, think carefully about whether you want to deal with fingerprints and scratching if you opt for that look. An expansive stainless steel backsplash, also on display at Salone, might be more practical. 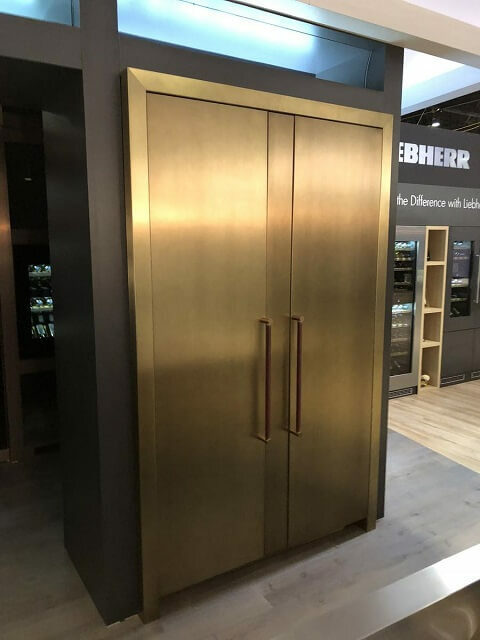 Some appliance makers are opting for metallic details such as gold hinges and door handles, which look sharp next to contemporary or industrial black or white fronts. Other brands are incorporating glittering metal handles, door frames and legs onto traditionally styled appliances in an array of options. Gold and chrome finishes are most commonly shown with a variety of brilliantly colored fronts. Metallics are showing up in decorative vessels, undermount and wading pool sinks, as well as in free-standing tubs, tile, accessories and lighting fixtures. Imagine installing a sleek oval tub in a warm copper finish or a transitional trough sink in hammered silver if you want to make a major statement. You can add a rustic metal detail to a shower surround with a distressed-look oversized tile slab, or a more subtle, upscale look with metallic detailing on traditionally sized tiles. Gold has become a hugely popular finish again in bathroom faucets and can be brushed or polished. Brushed looks more updated and sophisticated—especially in contemporary styles—and will be easier to live with in a heavily used space. 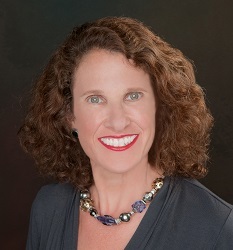 The good news about sink faucets is that they’re relatively easy to swap out if you tire of the trend in five years, or if it dates your home just when you’re ready to sell. It’s much harder to replace tub and shower sets. Gold has also become a popular finish for lighting sconces, pendants and mid-century modern-inspired chandeliers. If you want to add just a touch of this precious metal finish to your home, think small, easily changeable details like a pair of gold sconces flanking a vanity mirror or one on a stairway landing, rather than a ceiling full of gold-trimmed recessed lights or a two-story entry fixture. There are many ways to add a beloved style or hot trend like metallics to your home. It’s best to ask yourself how much and how long you’ve loved the look, how big of a statement you’re willing to make with a single trend, how it will impact your home’s resale value, and how quickly you might tire of something as splashy as metallic. Accessories might slake your style thirst—think kitchen canisters rather than cabinet fronts if you’re conservative—or a powder room faucet rather than refrigerator panels. You don’t have to go big or go home. Go home with touches that make sense for your life!